Search Minerals Announces Ten New F… | Search Minerals Inc.
TORONTO, Oct. 30, 2013 /CNW/ - Search Minerals Inc. (“Search” or the “Company”) (TSXV: SMY) and its wholly-owned subsidiary, Alterra Resources Inc. (“Alterra”) are pleased to announce the discovery of ten new Prospects in the Port Hope Simpson Rare Earth Element (“REE”) District in SE Labrador, with mineralization similar to that at the Company’s Foxtrot Project (“Foxtrot”) (the Company’s updated Preliminary Economic Assessment (“PEA”) for the Foxtrot Project was filed on SEDAR in May 2013 and is available at www.sedar.com and on the Company’s website). The new Prospects, Coastal Fox, Wiley Fox, Foxy Vixen, Fox Hound, Outfoxed, Jumping Fox, Awesome Fox, Fox Valley, Blackwater Fox and Fox Meadow, along with the four previously announced Foxtrot-like Prospects, Fox Pond, Foxy Lady, Fox Run and Fleet Fox, all occur within the Fox Harbour volcanic belt, the host of the Foxtrot REE Deposit. Search targeted these 14 Prospects, as well as additional targets with similar geophysical signatures and geology, in the Company’s 2013 exploration program. 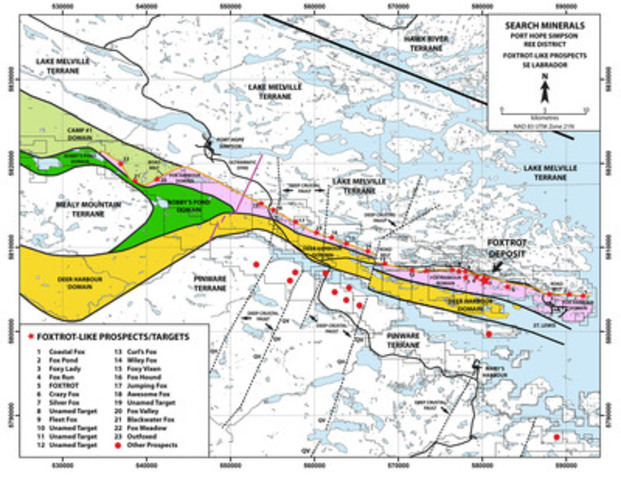 These Prospects occur in the Fox Harbour volcanic belt, which has been traced for 64 km between St. Lewis and Port Hope Simpson, Labrador (see Figure 1). Ten new REE Prospects (Coastal Fox, Wiley Fox, Foxy Vixen, Fox Hound, Outfoxed, Jumping Fox, Awesome Fox, Fox Valley, Blackwater Fox and Fox Meadow), along with four previously announced Prospects (Fox Pond, Foxy Lady, Fleet Fox and Fox Run), exhibit Foxtrot-like REE mineralization, grades and host rocks. 267 ppm Dy (306 ppm Dy2O3), 1,023 ppm Y (1,299 ppm Y2O3) and 1,460 ppm Nd (1,703 ppm Nd2O3) over 3.14m at Fox Meadow. The Foxtrot-like district-wide REE mineralization consists of the Foxtrot Deposit, 14 Foxtrot-like Prospects and additional Foxtrot-like targets that occur in a 64 km-long mineralized felsic volcanic belt. Exploration in the Fox Harbour volcanic belt for Foxtrot-like mineralization has been ongoing since 2010. Channel sample and grab sample results are presented from ten new Foxtrot-like Prospects: Coastal Fox, Wiley Fox, Foxy Vixen, Fox Hound, Outfoxed, Jumping Fox, Awesome Fox, Fox Valley, Blackwater Fox and Fox Meadow (see Tables 1 and 2). These Prospects exhibit REE mineralization consisting of allanite, zircon and fergusonite, associated with felsic volcanic rocks in a mafic-felsic bi-modal volcanic belt. HREE + Y values range from 19.64% to 27.87% [vs. 19.76% for the Foxtrot resource]. Given that the Foxtrot-like mineralization most commonly occurs in low-lying pond-covered or boggy and till-covered areas, the amount of outcrop is normally very low, resulting in few opportunities to observe and sample the mineralization. Drill programs are required to properly sample the Foxtrot-like mineralization at all of the new and the previously announced Prospects. There are now 14 Prospects that exhibit Foxtrot-like grades in the Fox Harbour volcanic belt. The Foxtrot High Grade Core (“HCG”) resource occurs over a strike length of 500m and a true thickness of 3 to 25m. Strike lengths at the 14 Foxtrot-like Prospects range up to 1,400m. Fox Pond and Foxy Lady are drill-ready targets, whereas the other 12 Prospects will require additional exploration work before drilling. Exploration work, including magnetic and radiometric airborne surveys and geological mapping-prospecting, in the Fox Harbour volcanic belt indicates that the belt is continuous over 64 km. At least six additional, poorly explored targets (little or no geochemical data), with similar geology and geophysical signatures occur within this belt. Significant stretches, over 1 km-long, have few or no highly mineralized outcrops, although poorly mineralized and other marker units are present. There are currently three identified sub-belts, with felsic volcanic-hosted REE mineralization, in the well-known portion of the Fox Harbour volcanic belt. Foxtrot, Fox Run and Silver Fox occur in the same sub-belt (Mt Belt; central sub-belt). Foxy Lady, Fox Pond and Fleet Fox, along with the ten new Prospects, occur in the nearby Road Belt (northerly sub-belt). The third sub-belt (South Belt) contains abundant low grade and minor occurrences of higher grade REE mineralization but no significant targets have been identified to date. The Road Belt has been traced over the 64 km-length of the Fox Harbour volcanic belt. Search is planning an exploration program for the 2014 field season to further map and sample Foxtrot-like mineralization throughout the Fox Harbour volcanic belt (targets and Prospects mentioned above) and to prioritize targets for a small exploration drilling program. The aim of this program is to discover/document additional Foxtrot-like deposits in close proximity to the Foxtrot Deposit, and to add to the Foxtrot resource (currently 9.3 million tonnes Indicated at 189 ppm Dy, and 5.2 million tonnes Inferred at 176 ppm Dy (see “Search Minerals Phase III Drilling Increases Foxtrot REE Project Resource Estimate by 55% of Similar Grade,” November 1, 2012). Dr. Randy Miller, Ph.D., P.Geo, is the Company’s Vice President, Exploration, and is a Qualified Person for the purposes of NI 43-101. Dr. Miller has reviewed and approved the technical disclosure contained in this news release as applicable. The Company will endeavor to meet high standards of integrity, transparency and consistency in reporting technical content, including geological and assay (e.g. REE) data.